Yesterday was the first day of summer and with it brings the onset of backyard parties and cookouts. Summer is one of my favorite seasons here in the Northwest largely in part to the beauty that we have surrounding us. Normally summer screams white wine or rosé but I’m here to tell you that you need to put those on hold and try our 2013 The Canyons Red Wine if you haven’t already. It will fast become your go-to wine for those backyard parties and cookouts that summer is so famous for. It’s made of 83% Cabernet Sauvignon and 17% Malbec, all sourced from The Canyons vineyard in the upper northwest portion of the Red Mountain AVA. One of my family’s favorite meals is soft tacos and I think there is nothing better than a piece of marinated beef cooked over hot coals. Usually we don’t care what is wrapped inside the soft and fluffy tortilla, only that it tastes good. After much research and deliberation, I decided upon a recipe that I could use as a starting point for Carne Asada. Each ingredient pairs beautifully with the well-structured tannins and delicate finish in The Canyons Red Wine. Cheers to summer! Place dried chilies on microwave safe plate and heat for 20 seconds until pliable. Place in blender and add chipotle, orange & lime juices, olive oil, soy sauce, fish sauce, garlic, half the cilantro, cumin, coriander & brown sugar. Puree until a smooth paste forms and ingredients are well mixed. Place beef into heavyweight zip top bag and pour half the marinade over. Reserve remaining marinade as a serving sauce. 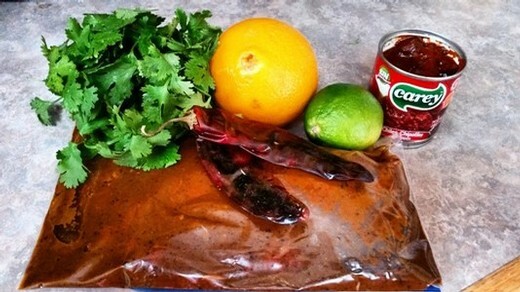 Place bag in refrigerator and marinate for 3 hours or overnight. When ready, heat charcoal or gas grill until hot. 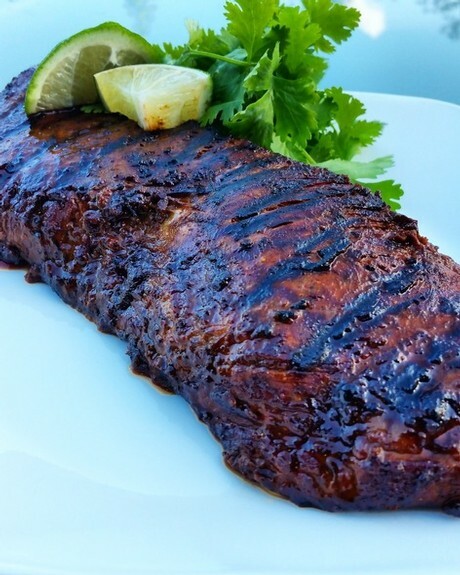 Wipe excess marinade from beef and place on hot grill, turning frequently until internal temperature reaches 110 degrees F. Remove from grill and let rest for 10 minutes. Slice against the grain and place inside warmed tortillas. Enjoy with 2013 The Canyons Red Wine! For many of us we are self-proclaimed wine aficionados, I know I have my moments. If you are asking my family and friends, they will tell you I am their go-to for wine knowledge. Although, I think I speak for many of us when I say, "I don’t know nearly as much as I sound like I do." Quickly after starting at Fidelitas a few years back I soon realized the most I knew about wine was how to drink it and that I only drink wines from Washington. I have since come along way and picked up great knowledge from fellow staff members, our customers, and a little lite reading along the way. This morning I had a lovely couple who was new to wine tasting, Red Mountain, and Fidelitas Wines. I was delighted to share a few educational tips that helped them not only during their visit but hopefully on their future tasting adventures. My favorite way to taste is to smell, sip, and savor. SMELL! First things, first…swirl and smell the wine. Swirling the wine helps to open up the aromatics within a wine. Then, don’t be shy get in there and smell your wine. Don’t think large scale while smelling a wine, start small. Try and pick out categories, red fruits, spices, smokiness, etc. These are some great characteristics to help build range and memory association. For me the hardest part is placing what I am smelling to something I am familiar with. SIP! My favorite part, now after you have smelled the wine go ahead and give it a try. Allow the wine to hit your taste buds and think about whether you are tasting bitterness, sweetness, sour, acidity, etc. For each wine this is different based on where it is grown, oak treatments, winemaker and all of that other fun stuff that plays apart in wine tasting. SAVOR! Now spend some time thinking about the wine, did you like the finish? Was it to fruit forward? Was it bold or soft? The number one thing when wine tasting is to decide if it was enjoyable or not. In my opinion, this is the hardest part. It is so easy to fall into old patterns and buy what we are comfortable with, but remember that you are wine tasting and exploring new things while building your palate. This time of year is perfect for wine tasting, there are new releases and fun things happening at almost every winery, get out there and explore! Also, in case you haven’t picked up or explored a copy of Wine Folly, it’s the perfect tool for every taster. This June, we are releasing a special set of wines, and with the temperatures (already!) so warm, I cannot imagine a better duo for the season. Around my house, we’ve already hosted backyard dinners, utilized the kiddie pool, and picked raspberries a full month before usual. This weather has me craving white wines that are crisp and refreshing, and reds full of flavor and concentration for those steaks from the grill. Before we get to enjoying, however, we have been learning about why these are such fun additions to the Fidelitas line up. To start – we have the 2015 Klipsun Vineyard Semillon. This is our 3rd vintage of white wines from Klipsun Vineyard, with each selling faster than the previous vintage. In the Fidelitas line up, we make just two dry white wines, using Semillon and Sauvignon Blanc, as these are two of the white wine varietals that would be found in the Bordeaux region of France. White grapes make up less than 5% off the total crop on Red Mountain, and being one of the hottest regions in the state, we think it is quite the feat to produce a quality white wine from this notorious red wine region. Klipsun Vineyard gives us all the fruit we need for our whites. 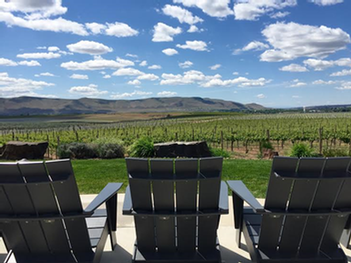 Not only is it one of the lowest elevation vineyards in the small, sloped, AVA, it is one of the most established and has excellent cooling winds from the Yakima River. Charlie told me: “older vines like this are sort of self-regulating. They produce the right yield and crop, we just have to know when to pick.” In the hottest vintage on record, picking earlier than usual (like my raspberries) was the key. This wine has me dreaming of buffalo mozzarella and peaches. 2013 The Canyons Vineyard Red Wine is 83% Cabernet Sauvignon, and 17% Malbec. In my house, it’ll be our go to for summer grilling and casual nights with friends. It’s approachable, fruit forward, and great with food. Following my fancy buffalo mozzarella salad, I’m going to do some nice burgers with Skillet’s bacon jam (make sure to try it at Summer in the City!) and settle in to my summer evening with this red blend. Cheers to you all. I hope your summer is full of great wine and friends. If you haven't already, check out everyvine.com. Cool stuff. This shot shows the steep canyons cutting through the middle of the vineyard. Our Malbec clock is in orange. The Cabernet Sauvignon is the dark green in the lower right. 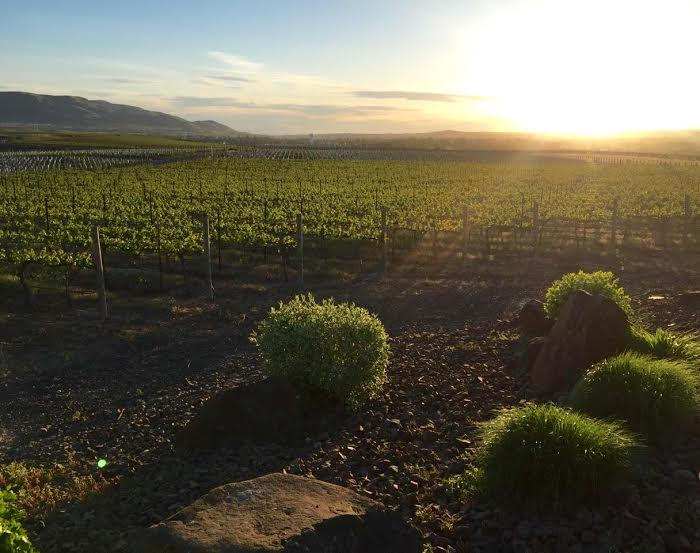 The Fidelitas Estate Vineyard is just beyond that, to the southeast. Clone 6 Cabernet Sauvignon. "The Winemakers Clone", planted about 400 yards from the Clone 6 in our 2015 Estate planting. And they didn't trust me to drive on these roads... Malbec in Block 11, tipping into one of the canyons. Charlie says, "check out that slope!" View of Malbec and Cabernet Sauvignon from the north blocks of Merlot. 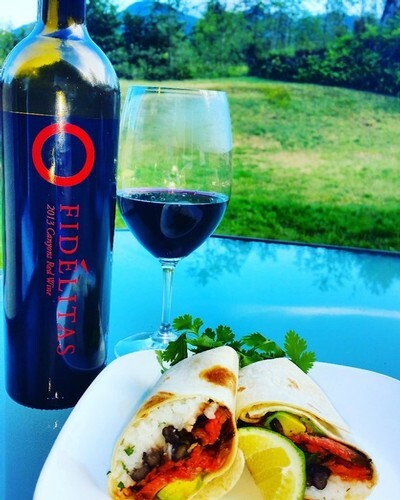 Summer plans are in full force and we sure hope that Fidelitas will be part of yours! With our new offering of Friday Tastings in Woodinville, Elevated Tastings for you and your friends, and the ability to reserve patio space on Red Mountain, there are so many options that could fit into your schedule. 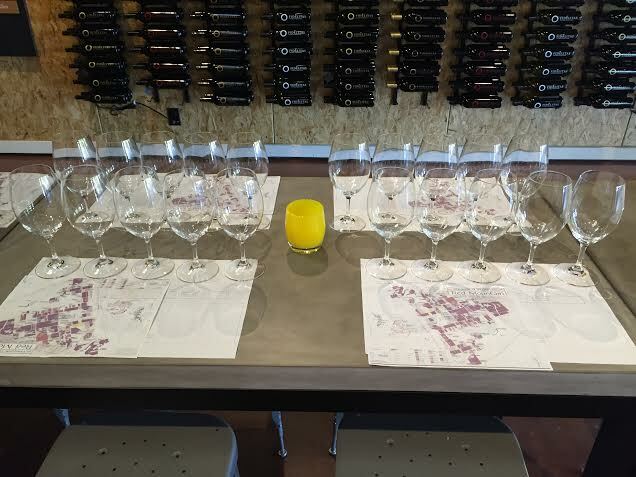 We started Friday Tastings in Woodinville last fall and it was a hit! An hour of tasting with Kathleen, what could be better? These are held every other Friday starting at 6pm and includes cheese + charcuterie plates with space being limited. The next tasting is on Friday, June 3rd so be sure to sign up with Amy, our Woodinville Tasting Room Manager, before it fills up! If Fridays aren’t a good day for you then do not fear! You can now schedule Elevated Tastings at either location (or Charles Fromage!) for you and your guests any day and any time. Do you only like Cabernet Sauvignon? Blends? Great! These tastings can be customized and also include tableside service. We all know how crazy our Woodinville location can be and having a guaranteed table for your tasting can make things easier on you. Oh, you just want to relax and look out at vineyards while the sun goes down? We had a feeling. That is why you can now reserve seats on our Red Mountain patio. Bring some food, a little water misting fan, and buy a bottle of wine to enjoy next time you are at our Red Mountain tasting room. Contact Chelsea, our Red Mountain Tasting Room Manager, for more information. Team Fidelitas appreciates each and every one of our customers. And that is why we want to give you the best experience every time you pay us a visit. Summer always goes by so fast, so be sure to include us in those fun filled months.